You're no doubt familiar with the slogan, "Better living through chemistry," which was adopted by a large-enterprise chemicals company all the way back in 1935. Well, after a different large-enterprise chemical company's experience with our own print management solution, we might coin the tagline, "Better living through PrinterLogic." That's based on the findings of a case study (TVID: 086-195-D66 ) conducted by the independent research firm TechValidate. The time the company's IT staff spent on print management plummeted by 90%. Printer downtime was slashed by 90%. The number of print-related service desk calls also fell by 90%. Remote server infrastructure shrank by 70%. And usage of print consumables (e.g., toner, paper) dropped by 70%. End-user printer installation has been simplified through PrinterLogic's intuitive self-service portal. Print-related WAN traffic has been reduced, thanks to PrinterLogic's intelligent use of bandwidth. Queue, driver and printer management is centralized and more efficient. Comprehensive auditing tools are now in place, along with a departmental chargeback policy. "PrinterLogic has made it easier for end users to connect to a network printer. It has also provided the IT staff with a better and easier way to manage the queue," said a company representative. The company's enthusiasm for PrinterLogic is reflected in how it ranked its new print management solution on a graded scale. Printer driver management, ease of deployment, speed of deployment, ease of use, and printing security all earned a rating of "excellent." And in dollar terms? 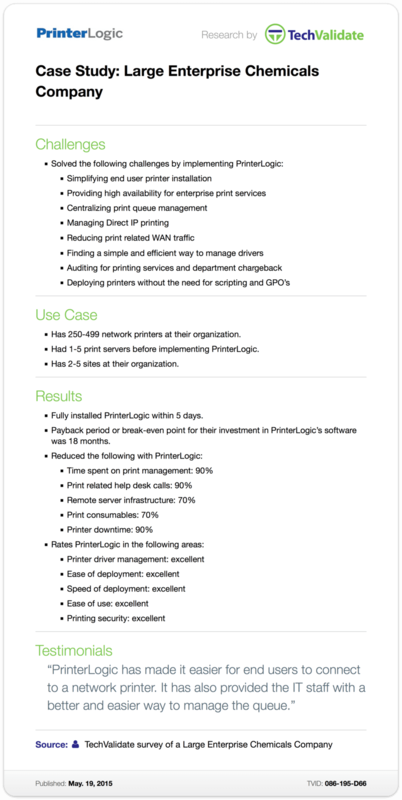 This large-enterprise chemicals company saw a complete return on its investment in PrinterLogic within 18 months. That means every efficiency since then—such as the staggering reduction in print consumables or the increase in printer uptime—has added to the return on investment (ROI). These days, this large-enterprise chemicals company enjoys more streamlined printer management, huge cost savings, and incredible productivity gains. That's better living through PrinterLogic!